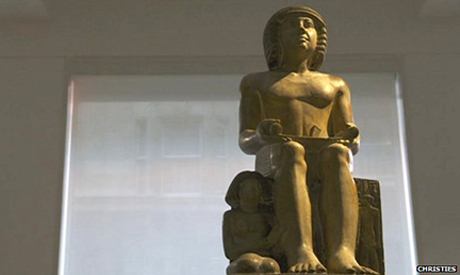 The 4,000-year-old Sekhemka statue is still in the UK despite being sold over two months ago to a private collector, Ahram Online can confirm. The statue was sold by Northampton Borough Council for £15.76 million at Christie's of London in July, despite an outcry from Egypt and campaign groups. While the identity of the new owner is not yet known, the campaign groups strongly fear the statue might have been sold to a wealthy Middle Easterner who will move it from the UK. The Save Sekhemka Action Group (SSAG) expressed its concern about the safety of the statute. “We are very keen to keep it safe from the present turmoil in the Middle East,” Gunilla Loe, the chair of the group, told Ahram Online. Campaign groups warn selling the statue to a private collector will deny the public of their right to view it. The new owner of the statue needs to apply for an export license to take it abroad. A spokesperson at Arts Council England (ACE) refused to say whether an application for an export license had been submitted. “We can neither confirm nor deny whether an export licence application has been received as we are bound by a duty of confidentiality – common law – and disclosure would be a breach of that confidence,” she said. It is understood that issuing the license could take up to three months. According to export licensing procedures, certain cultural objects more than 50 years old and valued above specified financial thresholds require an individual licence for export out of the United Kingdom, whether on a permanent or temporary basis. The ancient statue, which dates from 5th Dynasty and is believed to show Sekhemka the scribe with his wife, Sitmerit, was given by the Marquess of Northampton to Northampton Museum around 1870. “We are sure the license has not been issued yet. We are keeping our eye on it,” Loe said, pledging not give up till the statue is resorted to Northampton Museum for public view. On 1 August, the museum lost its accreditation status after the controversial sale of the Egyptian statue. ACE ruled the sale breached the accredited standards for how museums manage their collections. Egypt condemned the sale as an "an abuse of the Egyptian archaeology." SSAG regrets the museum’s loss of accreditation because it will mean the certain decline of the museum since the loss of this status stops it being eligible for outside grants from the Lottery, Arts Council England and other art and cultural grant giving bodies.